New year, new Moodle! If you haven’t had a new theme in a while, or, your current theme is no longer supported, now is the time to get started! We offer everything from off the shelf themes (including a few new ones that are not listed, just ask!) to complete custom theme packages that will exceed your expectations. Contact us today to get started! Moodle is a great LMS platform but it is not a great substitute for a traditional CMS and blogging platform like WordPress when it comes to SEO and marketing purposes. WordPress simply has more tools and plugins available for those tasks. While Moodle can be used marketing and SEO in a pinch, many clients find they need to use both platforms. This is where we can help. If you have a Moodle theme or design developed, we can also create a matching WordPress theme or design. If you already have a WordPress site, we can also build a duplicate Moodle theme. Your users can then flow seamlessly from one to the other without feeling like they have left your brand! Contact us if you’d like to learn more. Need a clean and fresh Moodle design that showcases your content and isn’t bogged down with features you’ll never use? Then check out Studio, our newest flexible and responsive design! Studio is easy to set up, simple to use and great looking. Features individual course banners, a unique course grid listing, color and social settings, and lots more. Plus, get personalized support when needed! Get it now for the low intro price of $29! Learn more about the theme here. A general Moodle theme trend out there is to use an image (that is set in a course) as either an ‘icon’ on the Moodle landing page and/or as a banner/cover image when inside the course. Some of our stock themes include this feature and clients love it. It provides a nice visual cue to learners about where they are and what course they are in. However, it is not always clear how to set this up and, because the course image dimensions need to be large, these images can often negatively impact load times. The following will quickly cover easy methods to optimize an image and then how to set it in the course for use in a theme. First crop and save your course image. For Moodle themes where the image is only used on the frontpage, we recommend 600px wide x 300px tall. 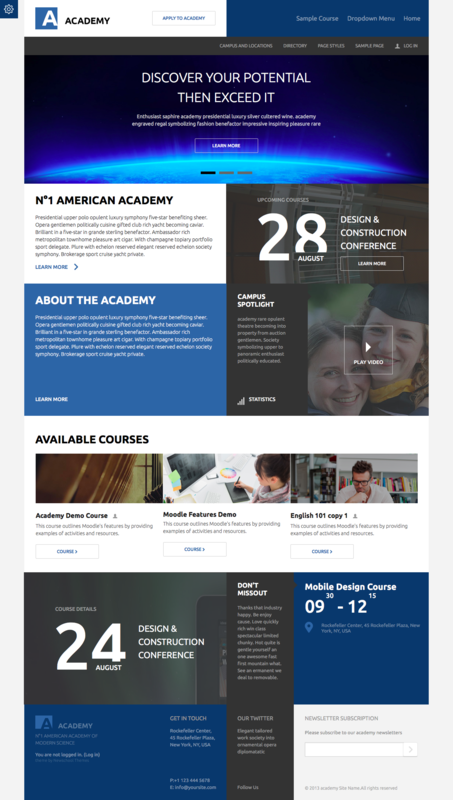 For Moodle themes where the course image is being used as a banner or cover inside the course, 1920px 1080 is more than enough. There are plenty of web-based services that you can use to ‘optimize’ your images but we prefer Kraken.io. The interface is easy to use. Just drag your images into the upload box, let Kraken do the work and then download them. They can often radically reduce the weight of an image. The next step is to add the image to the course. Login as an admin to your Moodle install. Enter the course and click on ‘Edit Settings’ under ‘Course Administration’ in the blocks area. Once in the settings scroll down to ‘Course Summary Files’. Drag your optimized image into this box, scroll to the bottom and hit save and you are done! Modish is a smart responsive design for Moodle 2.8, 2.6 and 2.7. It includes marketing spots that can be set from the settings page, a scrolling news ticker, call out sections, social media icon settings, grid and image course listing, image slider, hidden blocks and more. For a closer look and to try out a demo, check it out here. A custom theme settings page also includes settings for logo,colors, buttons, footer info, slider and more. Saturate is a clean responsive design for Moodle 2.8, 2.6 and 2.7. It includes marketing spots that can be set from the settings page, call out sections, social media icon settings, grid and image course listing, image slider, hidden blocks and more. For a closer look and to try out a demo, check it out here. A custom theme settings page also includes settings for logo,colors, buttons, footer info, slider and more. Check out our latest Premium theme: User Nav. This theme features a top dock position, fixed position user controls, Google fonts, custom settings page, and more! We can also customize this themes to fit your needs within our Basic Package.